Update: The NES30 controller from 8BITDO is very similar to this, but has many more features. I highly recommend checking out that one, before purchasing this. 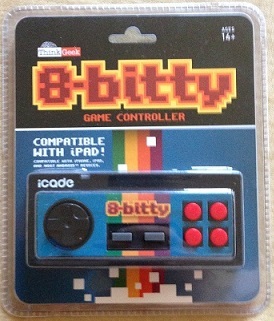 As soon as the iCade 8-bitty was announced, I really wanted one…and I have no idea why. Maybe it was the thought of a modern bluetooth controller modeled after the old NES controller? Maybe it was my love for everything retro game related? Maybe it was the cheap price of $30? Either way, I pre-ordered it the day it was available! The ergonomics are exactly what a retro-bluetooth controller should feel like! My only complaint is that it doesn’t have a phone clip like the Gametel does, so there isn’t a way to attach your iOS or Android device to it. As much as I love my Gametel controller, I’d actually much prefer to use the iCade 8-bitty, but there’s just no way to hold it at the same time as my iPhone. Since there’s no way to attach/clip it to a small device, you’re pretty much stuck using it with your iPad, or Android tablet. For some people, this might be fine, but I’d personally prefer my iCade for tablet gaming. If Apple someday allows for apps on Apple TV, this would make an excellent controller, but for now, the iCade 8-bitty can only be used with iOS or Android tablets. Sadly, for the reasons discussed in the main iCade section, it’ll never work properly with a PC or Mac. Either that, or the people who make the 8-bitty would have to make a “PC mode”, like the Gametel. At the moment, one of the only places to buy the 8-bitty is at thinkgeek.com, but it’s pretty cheap at $30. In conclusion, I love this controller, I just wish there was more I could do with it! Please feel free to go back to the main iCade hardware page to see more iCade-compatible controllers. Also, check out the main iOS / Android page for more info on games and software!